The Provincial Youth Committee is a collection of youth representatives and youth officers with representatives from all seven dioceses. The committee come together to discuss the status of the youth within their diocese, plan provincial youth events and to ensure the voice of the young people is heard. To ensure our young people are heard meetings are held by two youth representatives that hold the position of chair and secretary of the PYC. All youth representatives hold a voting position to ensure that it is the young people that make decisions about what happens within the province. The Provincial Youth Committee provides a safe space for young people to voice their opinions, be heard and have a role within the church. Whether you have one teenager in your church or a team of young people, they all need to know about provincial youth events. Keep an eye on the website for event forms, if you have any queries about any of our events do not hesitate to contact the connected youth officer. 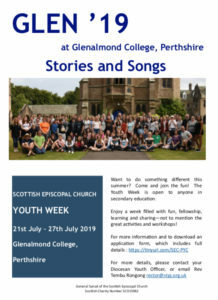 The Youth Week happens each year when young people and leaders from all over Scotland gather together for a week of fellowship, worship, activities, sports and evening events. It’s a fun-filled holiday week with a difference – there’s plenty of time to relax, make good friends and generally have a great week! You’ll be part of a house group, made up of people your own age meeting twice a day to discuss Bible passages with a theme throughout the week. Each group plans and leads their own worship – a different one each evening! Faith is explored with differing views and new experiences being encouraged at Glenalmond. The days are also made up of activities, worship and then evening events – with plenty of time to socialise and hang out. The Youth Week is open to anyone in secondary education up to, and including July 2019; also, those under 18 years old who have left full-time education. You must be sponsored by your local Scottish Episcopal Church congregation. Set in magnificent grounds about 10 miles from Perth, Glenalmond has superb facilities which include an indoor swimming pool, sports hall, sports fields, dedicated arts and music facilities. New and varied menus at every meal are provided in the magnificent dining hall. Accommodation is in modern halls of residence, in single or twin rooms. Each room has its own wash-hand basin and there are ample shower facilities in each house. Sheets are provided, but please bring a sleeping bag or duvet.